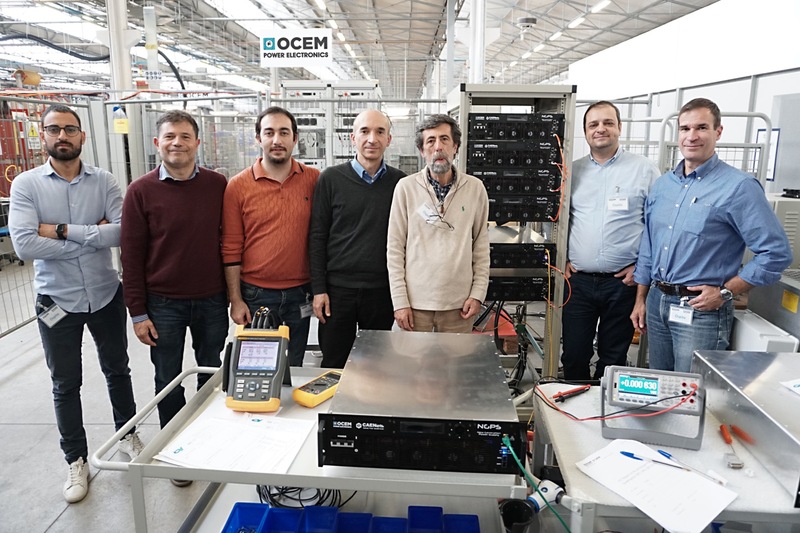 The ESS project team, from left to right: Giuseppe Torrisi of INFN-LNS, Roberto Donato of OCEM Power Electronics, Taha Gucin of Elettra Sincrotrone Trieste, Filippo Burini of OCEM Power Electronics, Mario Sedita of INFN-LNS, Carlos Martins representing the ESS and Roberto Visintini of Elettra Sincrotrone Trieste. OCEM Power Electronics is supplying a component for what will soon be the world’s most powerful neutron source: the European Spallation Source under construction in Lund, Sweden. Factory acceptance tests were successfully completed last week for the DC Power Converter prototypes for the ESS’s quadrupole and dipole magnets. The supplies required high stability and a low temperature coefficient, and were constructed based on the company’s NGPS standard power supplies in both single and parallel configurations. The ESS will be committed to neutron science, which is known as the “science of everyday life” because it drives everything from development of improved computer chips, batteries and other industrial products, to new insights and understanding into how the body works, to innovative pharmaceuticals and medical therapies. Once completed, the ESS’s neutron source will be up to 100 times brighter than today’s leading facilities. A liner accelerator will create protons at the ion source, then accelerate and steer them onto a rotating tungsten target to create neutrons via the spallation process. Besides the technical expertise required, the power converters supply gave OCEM an opportunity to showcase its project management skills, thanks to the many actors involved in the construction of ESS. Fifteen countries are participating in the pan-European project, with Sweden and Denmark serving as host countries. Italy will contribute EUR 110 million to the facility’s construction, 80 percent of which will be in-kind. Three institutions are overseeing Italy’s in-kind contributions: the National Institute for Nuclear Physics (INFN), National Research Council (CRN) and the research center Elettra Sincrotrone Trieste. OCEM worked with all three entities in addition to coordinating with the ESS itself. The company was chosen for its decades of experience creating components for particle accelerators. Since its founding in 1943, the company has supplied power converters to more than 50 research facilities in 20-plus countries, including four Nobel Prize-winning labs.